Hotel location was fantastic, high up, great views, although going into the town meant 100 step down and coming back meant 100 steps up, very steep. The hotel can only be described as an old folks home, in need of total modernisation. Nothing in the form of entertainment, so we just went around to other hotels in the evening, or other venues. 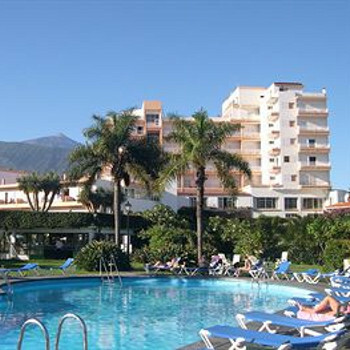 Puerto de la Cruz is a very quiet sedate location not for the young, only the lido and loro park are near by, any where else has to be travelled to. Buses are excellent, knowing what I know now I would only go to the south of Tenerife in future. Much warmer and livelier. The trip to the volcano is worth while, if only to travel above the clouds, this is the best description I can give. Thank you for reading and have a good holiday wherever you go. My wife and I (37 and 32) returned to the Miramar having spent a brilliant xmas week there in Dec 05. This time we were given an even bigger and better corner room with glorious views on two sides. Our room and the hotel in general was clean and the grounds were very well kept and looked even nicer than our first visit. The steps down into the centre of town are pretty steep and it's a good 20 minute walk (longer uphill) but you can always follow the road instead which is longer but easier on the legs or just spend 3 euros on a taxi (we didn't) or take the free hotel minibus. We had an even better holiday than the first time and we've already booked for Christmas this year! We thought that this looked a very nice hotel in the brochure. On closer inspection, on arrival ,it had very faded elegance. Eating in the Restaurant was like a noisy works canteen,and the food awful.We survived on healthy salads. The Staff were ok but only just! The rooms were clean but needed up grading. Mostly older people there and none seemed to use the Bar at night, so that was very quiet so no atmosphere. The entertainment to us was a joke.